Back in the (very) early 1990’s I rocked a deep plum or dark red lip. I was a fully paid up member of the Rimmel Black Cherry fan club (if there ever was such a thing). Deep red lips and black liquid liner along with patchouli oil perfume, long tasseled skirts or skinny black jeans and lots of big silver jewellery was my uniform (for want of a better word). Over the years I became more and more passionate about animal welfare and cosmetic testing and so switched my allegiance to The Body Shop – the ethical high street option (pre-L’Oreal of course). My black cherry lipstick was replaced by a chunky lip pencil that (possibly) went by the name Cinnamon. The Body Shop Cinnamon lip pencil (I’m going with Cinnamon but please correct me if you can better recall) was a deep, earthy, plum brown shade with a matte finish. Yes th formulation was slightly dry and yes there was drag but I loved it. The one draw back was that I never had a chunky pencil sharpener when I needed it so I remember using kitchen knives to sharpen it on a regular basis! 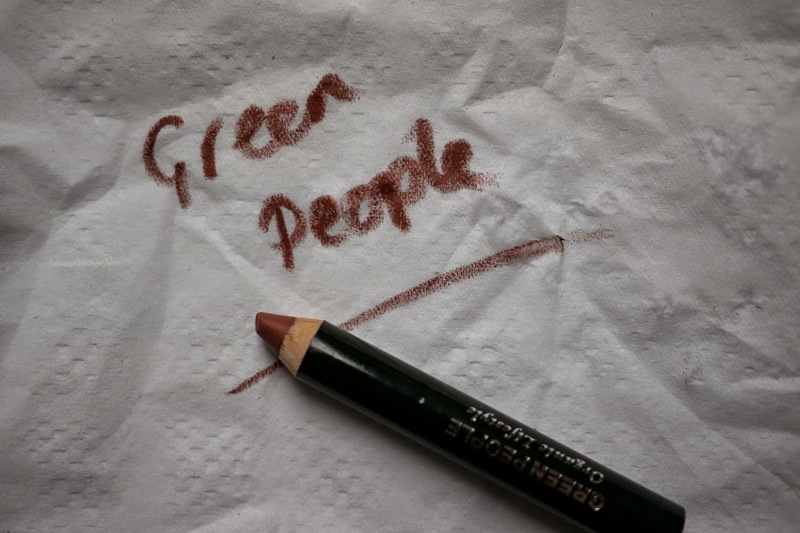 A few months ago I was kindly sent the (then) latest additions to the Green People make-up collection; a trio of chunky pencil style lip colours. I have been playing with them on and off over the past few months and it has been great to use a lip pencil once more. It sounds corny but there was an overwhelming sense of familiarity; holding and applying a chunky pencil shaped lip colour brought back all of these memories from my youth. Comparing the crayons to their early/mid nineties predecessor, times have defiantely changed and product development has moved on. This trio of pencils do need sharpening (they also kindly included a sharpener in the package) but that is pretty much where the similarities end; the texture, application, not to mention the ingredients are significantly improved (what would you expect?). 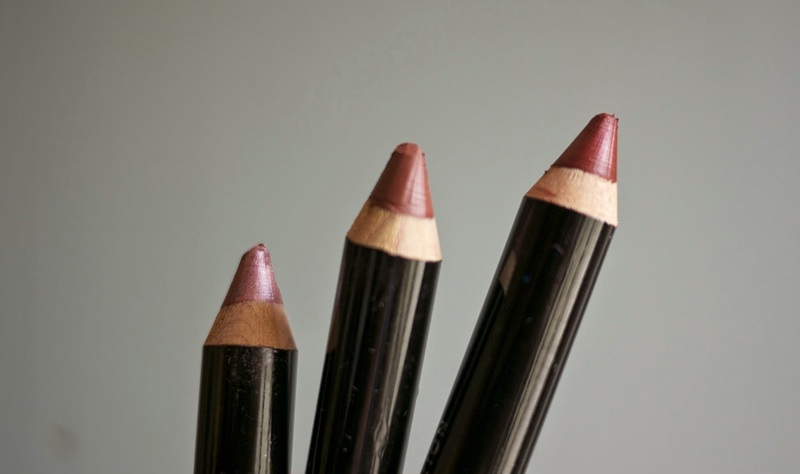 The crayons are rich and creamy in texture, making them easy to apply and means they don’t drag uncomfortably on the lip. They are also super handy for scribbling on napkins – I never have a pen when I need one! Ingredients wise, the Instant Definition Lip Crayons tick nearly every box. Packed full of botanical extracts such as Carnauba Wax, Shea Butter and Baobab Seed Oil, they hydrate and nourish the delicate skin on the lips. Their beeswax content does mean they are not suitable for vegans, however they are cruelty free and of course certified natural by ECOCERT. The three shades break down like this; Praline is a neutral earthy shade which can be built up to a deep matte brown; Blossom a delicate floral pink with a softly shimmering finish and Sangria is a rich burnished russet with a slight satin sheen. Of the three there is one that has had far more excursions than the others; Praline. I was surprised by this as I imagined that Sangria would be be pick of the bunch but Praline’s matte finish has won me over. As with most pencil products, the Instant Definition Crayons longevity of wear is pretty good – even if you are a lip licker like me. Green People also released Enrich & Enhance Lip Primer* around the same time which is designed to provide hydration to the lips whilst giving them a solid base on which to apply lip colour and increase wear. The crayons are priced at £12.95 and are available from Naturisimo and Lucy Rose (amongst others). Green People was founded in 1997 by Charlotte Vøhtz after her young daughter battled with multiple skin allergies and eczema. With over 100 award-winning, certified organic products that are free from SLS, parabens, phalates, petrochemical, alcohol, synthetic fragrances and colourants, the range is designed to protect, balance and respect your body.